Summer is over!!!! At least that's how I see it. Anyone that knows me, knows that I am not fond of summer. Seriously, I actually count the days from June to September, knowing that I'll be able to get out my Fall decorations soon, and forget the horrors of the summer heat, brown grass, swarms of bugs, and loud neighbors who like to barbecue to rap music until 2:00 in the morning. Oh I just love summer!!! 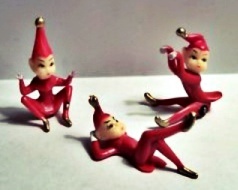 But I will admit that as a child, it wasn't so bad. For one thing, we had an in-ground swimming pool, and a very nice neighborhood to run around in. Never the less, my hard working father could usually be counted on to look up from his evening paper, and announce "Hey, I have a great idea!! We'll get up early tomorrow morning and head to the beach" We kids of course would jump up and down yelling "Oh boy!! Yhea!!! Lets get packed" And of course no one seemed to notice the faint look of panic and utter exhaustion on the face of my mother. Here it was, the end of August, with five kids to get ready for "Back to school" but hey, whats the big deal? It's just driving to the beach during holiday weekend, with the kids, no reservations, and no particular plan. Really, whats there to panic about? Oh and don't forget, at least one kid can be counted on to get car-sick about halfway to Lincoln City!! 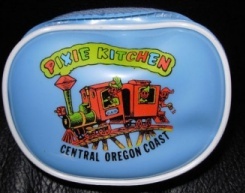 The Pixie Kitchen was everyones favorite!!! 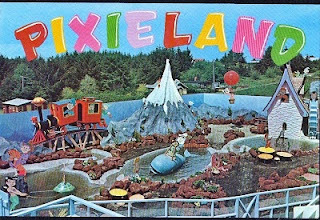 Decorated with pixie elves, beach motif, and an enchanted play land outside, it was a huge deal. When you finished eating, they brought pink or blue grab bags with little surprises in them for every child. They also had a wonderful gift shop with all kinds of treasures. You can't tell from the picture what a great place this was. 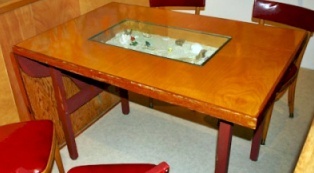 The tables all had beach sand with shells and mermaids under glass. 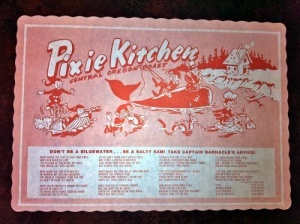 The tables had these cute placemat/menus on them. We also loved to hunt for sea shells on the beach, early in the morning. My father would go out for coffee while we got dressed, and then we would wait for him to take us down to the sand! I found out many years later, that he was buying shells at the gift shop while he was getting coffee, and hiding them in his jacket and pants pockets. As soon as we got on the beach, we took off!!! When he was sure we weren't looking, he'd toss a shell out, and one of us would see it, and scream "Hey look at this pretty one!! Purple and pink and green, and it floated here all the way from Japan! It says so right here on the bottom of the shell." Sheeezz, we were so clueless! Nothing like a little Labor Day beach vacation to end the summer and start the school year!! I still like to go to Lincoln City, however, all of the good stuff is gone now. But they do have casinos. I like to gamble, but when I'm at the beach, I think I like pixies and sea shells better. My name is Laura Miceli, and I was born and raised in Portland Oregon. I graduated from Reynolds High School, and married shortly after. Our daughter was born two years later, and I became a stay at home mom for the next 18 years. My beautiful daughter is our only child,and she simply takes my breath away! Now grown and married herself, she has made me a grandma of two little boys that I just adore!